In one of the most demanded locations on Marbella’s Golden Mile, Puente Romano, you will find this elegant 4 bedroom villa 2nd line beach right next to the Hotel Puente Romano’s Sea Grill restaurant. The sea views are from every level and the higher you get the better they are. The sea and coastal views from the roof top lounge area are magnificent and mesmerizing. The property has been recently renovated and completely furnished and offers on the ground floor a fully fitted kitchen with a breakfast sitting area, guest toilet, TV or office room and the big lounge and dining area with access to the spacious terrace and garden. The first floor is distributed into 3 magnificent en-suite bedrooms including the spacious master bedroom. The roof top lounge area has toilet facilities and could be converted into an additional bedroom including a roof top terrace which has the most outstanding panoramic sea views possible. With a separate entrance there is an additional guest bedroom or service quarter. This outstanding property includes a car port for one car. 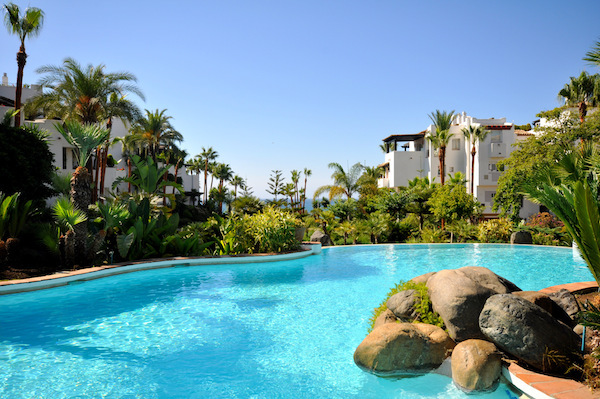 Qualities include a/c hot and cold, there is a covered out-door pool, fantastic sea views, great location with walking distance to the tennis club, gym and restaurants of the Hotel Puente Romano. 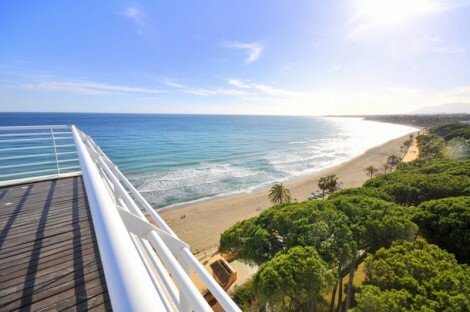 Please, send me more information about ref W-02E8GJ, Villa in Beach Side Golden Mile, Marbella Golden Mile or similar properties.